The taste of fresh baked hazelnut dough for you. Fill croissant, stollen, strudel, Danish pastry dough and enjoy the excellent result. It fits perfectly in yeast remaining in the maintenance of the freezer. Golden Brezel (Pretzel) mix for the traditional German Brezel sticks & Rolls. 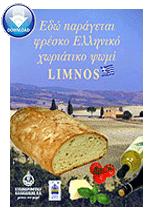 © Chalkidiki Flour Mills SA.